The armed protesters occupying the Malheur National Wildlife Refuge in southeast Oregon have indicated that they will leave if the locals so desire. Well, it's time for them to go: Harney County residents, who just held a huge community meeting about this invasion, seemed to heartily agree that they want the vigilantes to pack their bags and skedaddle. Sieges like the one happening near Burns exploit Western communities as a stage to perform political theater. The people involved bring violence and hostility to places that in day-to-day life are mostly noted for their tranquility. Last summer, for example, I visited a new sculpture park in the tiny mountain town of Lincoln, Montana. Locals had invited artists from all over the globe to create art that responds to the scenery of the area's majestic Blackfoot Valley. The result was a dramatic reclaiming of community identity. That identity had been called into question by the decline of logging in the 1980s and '90s, and by the FBI capture of Unabomber Theodore Kaczynski, who was living in a hermit cabin near Lincoln in 1996. The saying is that any press is good press, but in small towns, locals know this isn't true. Last August in Lincoln, as young children explored the giant works of art at the newly opened Sculpture in the Wild, a group called the "Oath Keepers" showed up in town. They sported camouflage clothing, toted military-style weapons and claimed to "defend" a local miner's claim on public land. None of the media representatives who covered the Oath Keepers' anti-government protest mentioned the jaw-dropping art just down the road from Lincoln's main drag. This international show of sculptors simply couldn't compete for news coverage with sinister-looking men, bristling with weapons. Over in my hometown of Salmon, Idaho, the Internet buzzed for two years running about an event – a wolf-hunting derby – that most of us didn't know existed until we saw it on the news. Granted, wolves are controversial in some circles. Still, most people here don't spend that much time thinking about the canine. After 20 years, most of us have gotten used to the predator's presence. But the 2013 and 2014 wolf derbies attracted emotionally charged hotheads from all over the country. The event was staged, in fact, to ignite a tired debate that most Americans have moved beyond. Salmon is a remote but amazingly beautiful little community. The Salmon River runs through the city, while the Beaverhead, Salmon and Lemhi mountain ranges stand guard. As in many small towns, people here are almost universally respectful, kind folk who take care of their neighbors. The tradition of hunting and fishing is sacred here, and most ranchers treat the lands with respect – even reverence – and are proud of conserving habitat for fish and wildlife even as they provide food and fiber for the world. But it's difficult to see beauty if you come here looking for ugliness. Christopher Ketcham, reporting for Vice magazine, made this astonishing comment: "The folks in Salmon hate environmentalists. It's a small town, and the people, thin-lipped and narrow-eyed, easily sniff out strangers." Oh, brother. These are the prejudices and stereotypes that we as rural Westerners too often confront, and it's up to us to change the narrative. The need for deep discussion about public lands is real. Those of us who live in communities surrounded by them know that wildfire, insects and weeds have moved in on lands that once provided a living for us. Our treasured national landscapes and the fish, wildlife and water within those landscapes are taking a big hit, and so are the communities whose fates are intertwined with them. Crossing into Harney County, where a group of self-described patriots occupied a wildlife refuge. All across the West, communities have been working hard to find real and lasting solutions to their problems. This patient work rarely grabs headlines in the way that gun-slinging, interloping blowhards do. The writer William Kittredge, who grew up in southeast Oregon, said of the area, "The northern quarter of the Great Basin, southeastern Oregon and northern Nevada, is a drift of sagebrush country the size of France. The raw landforms incessantly confront us with both geologic time and our own fragility. The rims were built over eons; we can see the layers, lava-flow on lava-flow. Shadows of clouds travel like phantoms across the white playas of the alkaline wet-weather lakes. But the endlessness of desert is not so intimidating if you focus on the beauties at your feet, red and green lichen on the volcanic rocks, tiny flowers." We who live in these lyrical and remote places have intimate knowledge of their value. We have an important story to tell. We should not let others such as the Bundys tell another story for us. 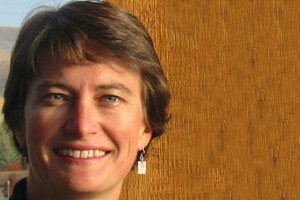 Gina Knudson is a contributor to Writers on the Range, the opinion service of High Country News. She writes in Idaho.